Oleg Novitsky, Peggy Whiston, Thomas Pesquet. Iowa-born astronaut Peggy Whitson is preparing for her third rocket ride to the International Space Station and spoke to Radio Iowa today from the training center in Russia. The Beaconsfield native has already spent 377 days aboard the orbiting station during missions in 2002 and 2007. 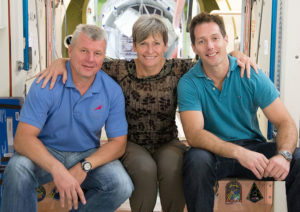 This coming February, Whitson will celebrate her 57th birthday there, some 220 miles up, and she’ll be the oldest woman ever in space, American, Russian or otherwise. American John Glenn took his final spaceflight aboard the shuttle Discovery at age 77, so is there the possibility this may not be her last mission? “I’d love to go when I’m 77, as long as I’m not dead,” Whitson says, laughing. The rigorous training regimen astronauts must endure is legendary but she says it’s gotten a little easier each time. Whitson has an impressive resume: She was the first Iowa woman in space. She was the space station’s first science officer, its first woman commander and she’ll be the first woman to command the station twice. She’s already logged more time in space and has done more EVAs — or spacewalks — than any other woman. There’s even a Peggy Whitson Science Center at her old school in Mount Ayr. Still, the former Iowa farm girl is humble about her long list of firsts and records. “I really feel very privileged and honored to be able to participate in the space program at all,” Whitson says, her voice cracking. “That’s what I’m most proud of.” Launch aboard the Soyuz MS-2 spacecraft from Kazakhstan is scheduled for November 15th. She’ll return to Earth next May.